← Tell the European Commission: No Palm Oil in my Tank! 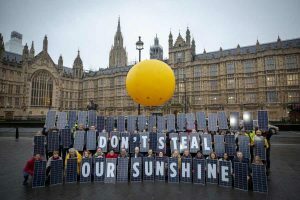 Add your name to demand a fair price for solar power. But over the last five years, government policies have ensured solar installations have tumbled. This March, ministers will end the guarantee that people installing solar panels get fair payment in return for clean power they send to the grid. Instead, they plan to let energy companies decide how much to pay for the electricity produced on our rooftops. It can’t be zero, but 0.000001p? Fine. We think the more power (and solar power!) in the hands of ordinary people, the better. But the government doesn’t agree, and is still helping funnel hundreds of millions to fossil fuels. Tell the government to guarantee solar homeowners a fair price for their solar power.